Irene Sarosiek, M.D., professor in the Department of Internal Medicine, was the lead writer of the article, titled "Gastric pH and Therapeutic Responses to Esomeprazole in Patients with Functional Dyspepsia: Potential Clinical Implications." 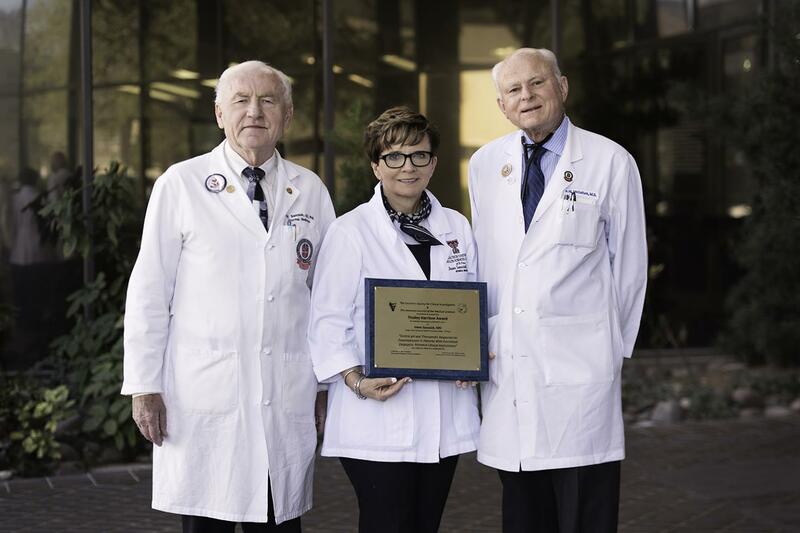 The report was the culmination of years of teamwork in completing a study designed by Dr. Sarosiek's husband, Jerzy Sarosiek, M.D., Ph.D., associate chairman for research in the Department of Internal Medicine. In addition to the Sarosieks, TTUHSC El Paso Professor Richard McCallum, M.D., was a contributing author of the article. The study looked at treatments for patients with functional dyspepsia, or patients who are feeling stomach pain with no obvious cause, like an ulcer or erosion in the stomach. They would also make sure the patients did not have a gastric infection with Helicobacter pylori, one of the leading causes of ulcer-like symptoms. The investigators examined the role of patients' own gastric acid secretion in the development of functional dyspepsia symptoms not related to Helicobacter pylori. In order to diminish gastric acid secretion and relieve symptoms of dyspepsia, the patients were treated with either the active drug esomeprazole or a placebo in a randomized, double blind, placebo-controlled clinical trial. "The concept of the whole study was designed and driven by my husband's thinking," Dr. Irene Sarosiek said. "The study, which started in 2004 at the University of Kansas School of Medicine, was very challenging. It was hard to recruit patients and very hard to conduct. But at the same time, the results that we got from the study were beyond our expectations." "So if a patient believes he or she is getting the drug, somehow the mind is having a measurable impact on gastric acid secretion," Dr. Jerzy Sarosiek said. Among the patients who received a dose of esomeprazole, relief of symptoms was reported in more than 70 percent, compared to 30 percent in the placebo group. In yet another unique aspect of the study, the patients who didn't report relief were then given a second dose. "With a double dose of esomeprazole, the number of subjects achieving relief increased to above 80 percent," Dr. Jerzy Sarosiek said. "A double dose of placebo also increased relief from 30 percent to close to 60 percent. This is the first study showing additive effects of two doses of placebo in relieving symptoms of dyspepsia in patients with stomach problems. Nobody had studied a double dose of placebo in patients with functional dyspepsia before." The award was created in memory of Tinsley Harrison, M.D., one of the founders of the Southern Society for Clinical Investigation. Drs. Irene and Jerzy Sarosiek and Dr. McCallum accepted the award at the society's annual meeting in February in New Orleans. "We feel very honored to get this award, and we want people on campus to know that, together, we can do work that is recognized nationally," she said. "We are a team at TTUHSC El Paso, and together we can do things that are amazing." For more information about Drs. Jerzy and Irene Sarosiek, and Dr. Richard McCallum, visit the department's webpage.